Exposure to toxins is a serious problem in companion birds due to several factors including their size, anatomy and physiology, and inquisitive nature. Often owners are unaware that certain substances can be toxic to their birds or unsure of the source of the toxin in their home. Lead poisoning has historically been the most common metal poisoning in caged birds. Due to increased awareness in recent years, its use in the home has significantly decreased, thus decreasing the incidence of toxicity in pet birds. Sources: Lead-based paint, curtain weights, bells with lead clappers, imported bird toys, stained glass, leaded crystal glassware, handmade jewelry, etc. Clinical Signs: Depression, foot and leg paresis, food refusal (anorexia), vomiting/regurgitation, seizures, hemoglobinuria, hematochezia (blood in the droppings), diarrhea. Diagnosis: History, clinical signs, blood lead concentration, radiographs (x-rays) to indicate if metal materials are present in the gastrointestinal tract. Blood tests may also show anemia, increases in liver and muscle enzymes and elevated uric acid (indicator of kidney function). Treatment: Removal of any lead based foreign objects present in the crop, cathartics (products fed that mechanically aid in the removal of small metal foreign objects from the gastrointestinal tract), and/or endoscopic foreign object removal. Chelation therapy should also be performed with DMSA/Succimer and/or calcium EDTA to remove lead that has entered the systemic blood stream. Public Health Consideration: If a bird or any pet in the home is diagnosed with lead poisoning, always recommend that people in the home be tested too. Zinc poisoning is the second most common metal poisoning in caged birds and occurs following ingestion of zinc-containing items. Sources: Galvanized products such as wire cages, mesh, staples, nails, zippers, and toys. (Galvanization is the process of coating a metal with an alloy containing more than 98% zinc which is done to protect against rusting.) Additional sources include fertilizers, some paints, and pennies minted after 1982. Diagnosis: History, clinical signs, radiographs, elevated blood zinc concentrations. Treatment: Removal of zinc from GI tract is typically sufficient provided the animal is stable. If zinc cannot be removed promptly, chelation with calcium EDTA or DMSA should be performed. All owners of caged birds must be advised never to feed avocado as it is extremely poisonous to birds and can result in death. Sources: Clinical signs are believed to be caused by the compound persin, which is found in all parts of avocados in the Persea genus (the most available for human consumption) and in the leaves and bark of their trees. Treatment: No antidote exists. Supportive care includes oxygen, fluids, sedatives, removal of avocado from crop with lavage and activated charcoal. Fumes emitted from overheating cookware or products with Teflon are deadly to pet birds. Sources: Nonstick surfaces on Teflon or ANY coated non-stick cookware, drip pans, space heaters, irons, ironing board covers; stain-guard treatments for upholstery. Toxic particulates and gases are produced when the surface is heated to 280o C (536o F). This can occur when a pan boils dry or an empty pan is heated on high (poisoning is not expected during routine cooking). Clinical Signs: Acute death due to respiratory failure. Mild exposures may cause dyspnea (difficulty breathing), ataxia (incoordination), depression, or anxious behavior. Diagnosis: History, clinical signs, pathologic lesions (fluid and blood-filled lungs). Treatment: No antidote exists. Supportive care includes oxygen, anti-inflammatory drugs, diuretics, analgesics, bronchodilators, antibiotics, topical ophthalmic ointment (if ocular irritation). Birds have a very efficient system for gas exchange and this means more toxins are also transferred into the bird with each breath, making them more sensitive to harm from inhaled toxins. This is the reason canaries were historically used in coal mines to warn for the presence of carbon monoxide and other noxious gases. Sources: Gasses like carbon monoxide, smoke from tobacco products, fumes from new carpets and furniture, air fresheners, scented candles, paints, glues, household cleaning products, mothballs, hair spray, and nail polish can all be harmful when they are in close proximity to birds. With appropriate ventilation and use, these substances are rarely toxic. Clinical Signs: Variable based on source and level of exposure. Acute death, dyspnea (difficulty breathing), eye irritation, nasal passage irritation, possible immunosuppression. Diagnosis: History and clinical signs. Treatment: Similar to PTFE (Teflon). How to Protect Companion Birds: When using products that give off strong fumes, it’s best to move the bird to a separate room in the home and open windows to ensure plenty of ventilation. Placing a towel under the door of the bird’s room can also help reduce fumes exposure. When painting walls in a home, the use of VOC-free paints (volatile organic compounds) may be safer. Alternatively, consider boarding birds off-site during construction, remodeling, or intense whole-house cleaning until odors have dissipated. Degernes, Laurel. Avian Toxicology: Common Problems. Presented at the Annual Conference of the Association of Avian Veterinarians, San Diego, CA. 2010, August. 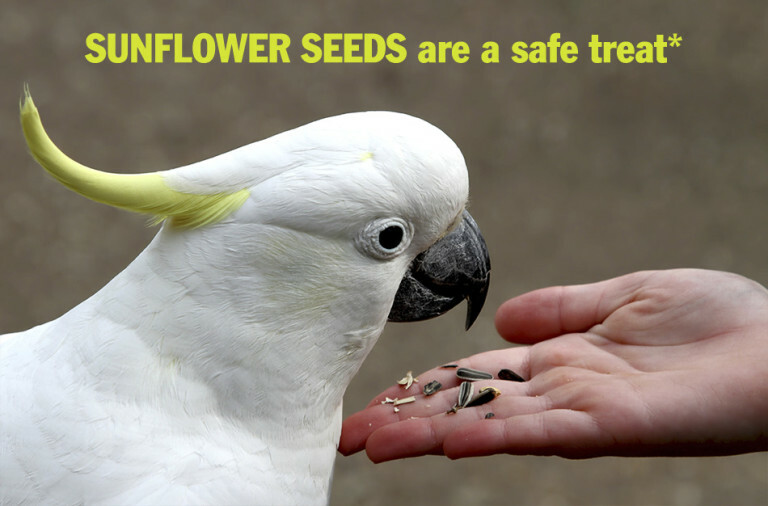 *Sunflower seeds are safe for birds, but we consider them more like junk food – use them only as an occasional treat for your pet bird. Looking for nutritious and safe treats for your pet? Here are some recipes for healthy treats for your pet birds.